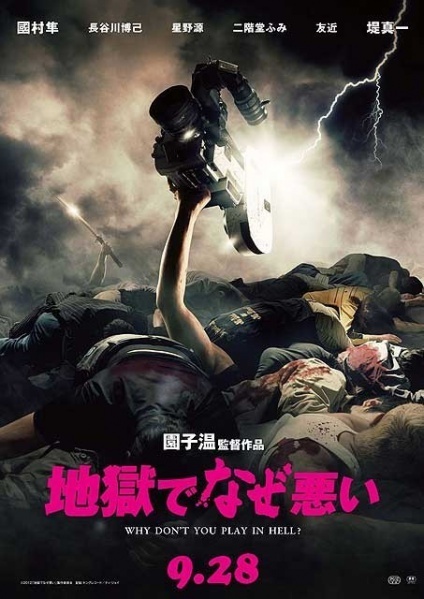 I posted the trailer for Sion Sono’s latest film Why Don’t You Play in Hell? last week and Tired Paul suggested I make some Gifs for the film… Little did he know I was already doing it! Well, I posted them on my Tumblr. Some are so large I need to post them here because of the file upload limit on Tumblr. So, here’s the film done through the power of Gifs (I expect this post will take ages to load due to the size and number of the things). are rival gangsters who despise each other but there’s a catch for Ikegami… he loves Muto’s actress daughter Mitsuko (Nikaido).